WSA500 programming assignment specifications, document 4, for the November 29 due date. Link to the specifications document 3. Just before the Friday (November 22) due date, some students reported a problem when configuring new or existing Space and Opening objects. The original design had the Space class with a to-many association with the Opening class. The implied reverse association was to-one. That’s the problem. An Opening object must have zero, one, or two Space associations. It appears that the solution to this problem is to add an ICollection<Space> Spaces property to the Opening class. That will require another Code First Migration to be configured. 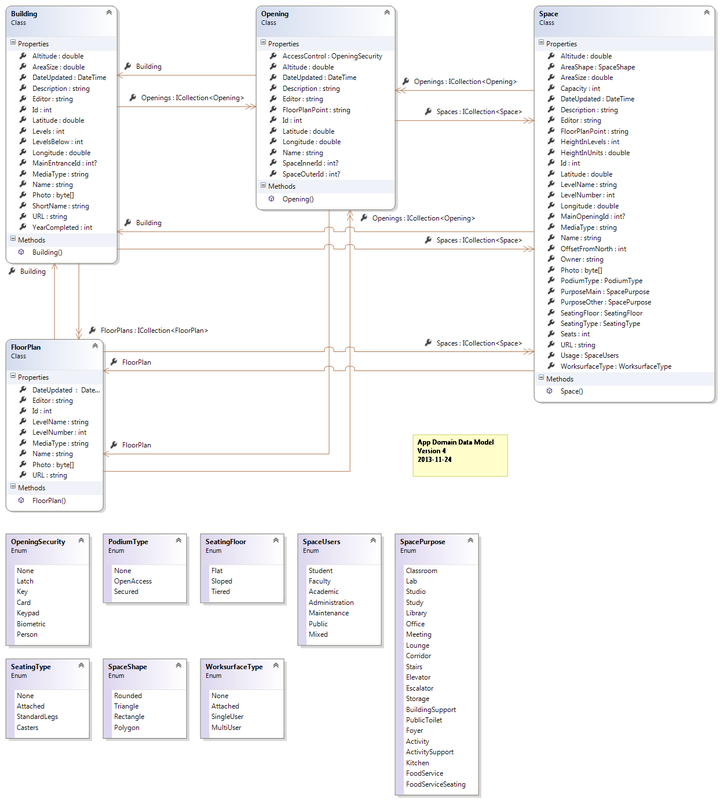 An updated app domain model class diagram has been posted here (and the assignment ‘overview’ document has been updated too). A typical ‘OpeningAdd’ view model will likely already have int properties for SpaceInnerId and SpaceOuterId. In the repository method that handles the ‘add-new’ Opening task, use these values to validate (obviously) the existence of the Space objects. Take advantage of the validation action to add these Space objects to the “Spaces” collection. When coding the ‘update-existing’ task, a good approach would be to replace the Space objects in the “Spaces” collection with the validated Space objects identified in the SpaceInnerId and SpaceOuterId properties. These tasks are documented in the sections below. In the previous deliverables, you have focused your efforts on building the foundations for your web service. For this final deliverable, think about use cases. What data will users want? What tasks will they want to do? Another example: Would it be useful to deliver a Space object, with a nested collection of Opening objects? Yes it would. Another example: Would users want a list/collection of all “Lab” spaces? “Stairway” spaces? See how easy it is to come up with use cases? Add code to your web service (controller methods, view model classes, repository classes, etc.) to support these new resources. As noted above, you should add a reasonable number (five to ten). If you did not complete the work required for deliverables 1, 2, or 3, now is the time to do that. Review your code, and edit to make it clean, standard, and commented. Add code comments (where appropriate) to ensure that you (in the future) and your professor (in the present) understand your thoughts and coding style. You do not have to comment obvious and simple code, but you should add comments to code that’s not obvious. Make your code a pleasure to read. Remove old code that you have commented out. Optional: If you want to suppress the compiler warning messages that begin with “Missing XML comment…”, you can change a project setting. Open your project’s properties page. On the “Build” tab, there’s a text field titled “Suppress warnings:”. In the text field, enter the number 1591 (that’s the error message number). Look for opportunities to refactor your code to make it better. For example, each controller class has repeated code blocks to generate the HttpResponseMessage for the get-one, add-new, and update-existing methods. Can you replace the repeated code with calls to a new private method in the controller class? Use Fiddler to test your work. Save the results in a Fiddler session archive. Normally, Fiddler’s “File > Export Sessions” settings include the body of the request or reply only if the number of characters in the body is very small. You must change a setting in Fiddler to increase the value. This post teaches you how to change the setting. Send these requests as different users (with different access tokens), to show the correct functionality. Include the session archive alongside your project’s “solution” file (which is also at the same level in the file system as your project and “packages” folders, and the ‘publish settings’ file). You should have already done this for deliverable 3. Update (deploy) your web service to a Windows Azure web site. When you zip-and-submit your project via My.Seneca/Blackboard, include the URI to your publicly-available Windows Azure web site.